The Harvard Business School’s Professor Josh Lerner and Professor Antoinette Schoar of MIT Sloan School of Management published a paper that explores the rise of angel investing and compares it to venture capital. Lerner and Schoar explain the positive outcomes of angel investors by arguing that they provide “value added and hands-on improvement … rather than just access to funds.” The paper makes a good case for the use of angel investing as a way of improving the entrepreneurial ecosystem in a region. But in the rush to embrace VC investors, there has been a tendency to neglect other entrepreneurial financiers that critically affect the success and growth of new ventures. We focus in this essay on a neglected segment of entrepreneurial finance: angel investments. Angel investors have received much less attention than venture capitalists. But we argue that over the last decade they have become an important seed-stage funding source that is often complimentary to VC investors. Angel investors are high-net-worth individuals, often (but not exclusively) former entrepreneurs and corporate executives, who make private investments in start-up companies with their own money. While individual angel investors have a long history—for instance, Naomi Lamoreaux and co-authors highlight how Cleveland’s angel investors played a critical role in financing the early electricity and automotive industries2—organized angel groups are a quite recent phenomenon. Beginning in the mid-1990s, angels began forming groups to collectively evaluate and invest in entrepreneurial ventures. 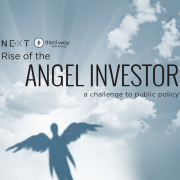 Angels are high-net-worth individuals who use their personal wealth to make equity investments in private companies. Angels typically invest at the seed funding stage, making them among the first equity investors in a company beyond its founders. Angels often act as mentors to the founders of the companies in which they have invested. Angels invested a total of $24.6 billion in 2015 with an average deal size of $345,390, according to the Center for Venture Research. VCs are firms who use funding provided by third parties, such as pension funds and university endowments, to make equity investments in private companies. VCs mostly invest after the seed stage in a series of larger funding rounds. Their goal is to shepherd companies to an exit—either an Initial Public Offering (IPO) or the company’s sale. VCs actively engage with the companies in which they have invested, usually taking board seats to influence company decisions. VCs invested a total of $59.1 billion in 2015 with an average deal size of $13.5 million, according to the National Venture Capital Association. Angel investors are increasingly structured as semi-formal networks. They typically meet at regular intervals (often over a monthly breakfast or dinner) to hear aspiring entrepreneurs pitch their business plans. The angels then decide whether to conduct further due diligence and ultimately whether to invest in some of these deals. Similar to venture capitalists, angel groups often adopt a very hands-on role in the deals they invest in and provide entrepreneurs with advice and contacts. Angels can pool their capital to make larger investments than they could otherwise. Each angel can invest smaller amounts in individual ventures, allowing participation in more opportunities and the diversification of investment risks. They can undertake costly due diligence of prospective investments as a group, reducing the burdens for individual members. Angel investor groups are generally more visible to entrepreneurs and thus receive a superior deal flow. Finally, the groups frequently include some of the most sophisticated and active investors in a given region, which might result in superior decision making. Angel groups follow mostly similar templates. Entrepreneurs typically begin the process by submitting to the group an application that may also include a copy of their business plan or executive summary. The firms, after an initial screening by the staff, are then invited to give a short presentation to a small group of members, followed by a question-and-answer session. Promising companies are then invited to present at a monthly meeting (often a breakfast or dinner). The presenting companies that generate the greatest interest then enter a due diligence review process by a smaller group of angel members, although the extent to which due diligence and screening leads or follows the formal presentation varies across groups. If all goes well, this process results in an investment one to three months after the presentation. Figure 1 provides a detailed template for one such angel group. Web Application – Entrepreneurs apply to TCA on the Internet. This process includes filling out a 4 page overview of their startup venture. Admin Screen – TCA staff perform a quick screen on the application to insure it is within the target area for a TCA venture. For instance, we typically fund between $250,000 and $1 million. If a company is seeking outside this range, typically they are not moved forward to pre-screen. Pre-Screen – In Orange County entrepreneurs present a brief overview of their company to 3-7 TCA members. This includes 5 minutes of presentation and 25 minutes of informal questions and discussion with the TCA members. At the conclusion of this session, the prospective company is moved to screening, or given feedback why they might not be a good fit for TCA. Screening – Typically 3 companies present at a screening. This consists of 15 minutes of PowerPoint and 15 minutes of Q&A. After the Q&A, we ask the entrepreneurs to leave the room and we discuss the company in private (typically takes 10-15 minutes). The entrepreneurs are invited back into the room, and a designated member provides quick feedback. Typically, the companies present at all 5 chapters. Therefore, it is possible for a company to get little interest at one chapter, but enough interest at another chapter that will allow it to move forward to due diligence. In Orange County we utilize a moderator to facilitate the sessions. This is intended to help balance questions for our members such that a member will not dominate the Q&A time. If you are a prospective member you are welcome to ask questions during the Q&A portion of the presentation. Due Diligence – A due diligence team is formed based on the number of interested members who signed up during the screening. A deal lead steps forward and helps coordinate the due diligence activities. Due diligence consists of verifying representations by the venture, customers, agreements, references, backgrounds, etc. The results of the due diligence process are posted on the TCA website (members only section), and if the results are positive, the venture moves forward to dinner meetings. Dinner Meeting – Companies that pass due diligence present at monthly dinner meetings at each chapter. This allows them to get in front of members who might not have seen them at screening or were involved in the due diligence process. This is the opportunity for the entrepreneurs to garner enough interest by members to secure funding. Funding – Funding occurs after there has been enough interest generated through dinner meetings and internal communication from the entrepreneur and deal lead. Members invest in deals individually, thus only a small percentage of members need to participate for the venture to secure funding. Typically, the minimum investment amount is $25,000. The short answer to this question is “surprisingly little.” Researchers—in large part deterred by the difficulty of getting systematic data about these investors—have shied away from research on this topic. This neglect is unfortunate, as the last decade has seen a rapid expansion and deepening of the types of vehicles that fund start-up firms in the U.S. and worldwide. In particular, we have seen a growing role of angel groups and other more “individualistic” funding options for start-ups, such as super angels or crowdsourcing platforms. This trend has not only been prevalent in the U.S. but also in many other nations.4 One could argue that the funding of new ventures by wealthy individuals is one of the oldest forms of outside investment that exists, especially where capital markets and financial institutions are less developed. In this paper, however, we focus on the organized angel market as a growing form of start-up investing that is less formal than the VC market but more professional than receiving funding from friends and family. The precise measurement of the total size of the angel investment market is difficult to ascertain due to the fact that most angel investments are made on an individual basis and thus typically are not subject to regulatory disclosure requirements. But estimates suggest that the total size of angel investment has long surpassed venture capital investment in the U.S. and increasingly in some other countries as well. For instance, survey estimates suggest the projected size of the total angel market in the U.S. grew from $17.6 billion in 2009 to $24.1 billion in 2014.5 The estimated capital deployed by angel groups in Europe has almost doubled over the past five years, and in Canada, it almost tripled.6 Some estimates suggest that these investors are as important for high-potential start-up investments as venture capital firms.7 But despite their rapid growth, we know very little about the role that angels play internationally and the type of firms in which they invest. The appeal of angel investors is that they share many of the positive features of venture capitalists. They fund early stage entrepreneurs, undertake intensive due diligence of potential investments, and serve as mentors and (sometimes) outside directors for the entrepreneurs.8 But because angels invest their own money, they should be less prone to agency problems that have been documented for VC funds: for instance, fee-based compensation structures can lead to excessive fundraising or sub-optimal investment and exit decisions. The consequences of these agency problems may be periods of overfunding in certain sectors.9 Active involvement in the investments and close social ties between angels and entrepreneurs may help to overcome the lack of minority shareholder and legal protections that are important for the development of more decentralized capital markets.10 Reflecting these patterns, governments are increasingly seeking to encourage angel investment, as the OECD reports cited above document. The hope is to encourage alternative mechanisms for funding new ventures and to improve the ecosystem for entrepreneurs. Relying on an idiosyncratic and decentralized angel investment process, however, might lead to challenges of its own. Since angels are typically not professional investors, there is a worry that entrepreneurs will be exposed to idiosyncratic funding risk, either because angels themselves might be subject to idiosyncratic liquidity shocks or because they might change their opinions more frequently about what projects to fund. Additionally, angels might not be prepared to invest in truly disruptive or high-growth projects, since they are usually more risk averse than institutional investors due to limited diversification. They also might not have the professional expertise to invest in more complex technologies. Finally, there is a concern that in countries lacking the culture or infrastructure to support start-up investments, angels only waste their time and money with no real impact. In recent work, we have sought to better understand the impact of angel investors, both in the United States and worldwide. The challenge of such an evaluation is to separate the screening function of angels from their role of providing value added to the firms they fund. The former channel relies on the idea that angels might have access to better deals or are good at picking superior firms and, as a result, funded firms have better outcomes than nonfunded ones. In contrast, the second channel asks whether, above and beyond their ability to pick good deals, angels have an incremental impact on improving the performance of their start-ups, for example by mentoring the founders or helping them with introductions to their business network. Interestingly, we did not find an impact of angel funding on follow-on financing when using the regression discontinuity approach. This difference to the estimates, based on a simple comparison between funded and nonfunded firms, may suggest that access to additional financing may not be essential for the success of angel-funded firms just above the threshold. But when looking at the full distribution of funded versus nonfunded ventures, the positive selection bias of receiving angel funding translate into a higher likelihood of follow-on funding. This result might also underline that, in the time period we studied in the U.S., prior angel financing was not an essential prerequisite to accessing follow-on funding. We believe that this result also underlines that the market for start-up capital during that time was very deep and liquid, and thus even ventures turned down by our angel groups found alternative funding mechanisms. In a final step, we compared the returns of the venture capital industry to that of one of the angel groups. A natural concern is that these investments are by angels who are not professional investors, and thus their decisions and voting may be shaped by factors other than economic considerations (e.g., the joy of working with start-up companies). While our project focused on the consequences of financing for start-up ventures, this additional analysis helps confirm that the investments were warranted for the angel group as a whole. We found that the angel group outperformed the venture capital industry overall during the period of study. Thus, this paper provided new evidence about an essential question in entrepreneurial finance. We were able to quantify the positive impact that these two angel groups had on the companies that they fund by simultaneously exploiting novel, rich micro-data and addressing concerns about unobserved heterogeneity. We should note, however, that the angel groups that we worked with for this project were two of the largest and most established groups in the country. They were both professionally managed, and at least one group outperformed the venture industry as a whole during the period we studied. Given the substantial heterogeneity across angel investors, the magnitude of the impact that we estimate is likely to be at the upper end of the angel population. In a second, more recent analysis, we looked at angel investors globally.15 This paper seeks to understand the differences in the nature and consequences of angel investments across a variety of geographies that differ in the development in their venture capital markets and other forms of risk capital. We first ask whether angel investors improve the outcomes and performance of the start-ups in which they invest. Furthermore, we ask whether and how the types of firms that seek angel funding vary with the overall entrepreneurial ecosystem in a country. For example, does the pool of start-ups that apply for angel funding differ in their risk profile, development stage or industry concentration in places where the entrepreneurial ecosystem is less friendly? For that purpose, we examine the records of 13 angel investment groups based in 12 nations and with applicants for financing transactions from 21 nations, examining both the applicants that were considered and rejected and those that were funded. To differentiate the value added of angel groups from their ability to select good investments, we employ the type of regression discontinuity analysis we used in the analysis of U.S. angel groups (described in endnote #11). We use discontinuities in the funding likelihood of start-ups that are based on a cumulative level of interest around the deal on the part of the angel groups. This allows us to examine not only whether angel investors add value to the companies in which they invest in general, but also how their impact and the types of transactions undertaken varies with the development of the venture markets in these nations. Our key findings from the analysis of angel investing around the globe are twofold. First, angel investors have a positive impact on the growth of firms they fund, both in terms of their performance and survival. Start-ups funded by angel investors are 14% to 23% more likely to survive for the next 1.5 to 3 years and grow their employment by 40% relative to non-angel-funded start-ups. Angel funding affects the subsequent likelihood of a successful exit, raising it by 10% to 17%. Having angel funding also seems to matter significantly for the ability of a firm to obtain follow-on financing. This last result differs from the findings in our earlier paper, which showed that angel investments in the U.S boost start-ups’ survival and performance but do not impact their likelihood of future fundraising. This result suggests that angel groups outside the U.S. serve as an important accreditation or gateway for follow-on funding. Risk capital in the U.S. may be more abundant, and therefore start-ups have many different avenues of obtaining their initial seed funding, including venture capitalists. As a result, U.S. firms do not necessarily have to raise an angel round before getting funding from larger players. Second, we find that the selection of firms that apply for angel funding is different across countries. In countries that have a less conducive entrepreneurial environment, companies seeking angel funding appear to be more established and are usually already revenue generating, compared to applicants in more entrepreneurship-friendly countries. Yet despite their apparent greater maturity, the firms in these markets seek smaller amounts of funding. We proxy for the entrepreneur-friendliness of a country with (1) the depth of the VC market as a fraction of GDP and (2) the number of regulatory procedures while incorporating a firm, taken from Djankov, et al. (2002). Given that these are countries with a less developed ecosystem for risk capital, it is difficult to believe that entrepreneurs in these countries have many other sources of capital. Instead, the results suggest that firms seem to “self-censor” when they apply to angel groups in the less venture-friendly markets, reflecting the fact that the angel investors themselves are more risk averse or less experienced in assessing very early stage investments. So despite being at a mature stage of their development, these firms receive less funding from the angels, which underscores the less favorable entrepreneurial investment climate in these countries. This work suggests a variety of avenues for future research to better understand these important new investors. First, we have suggested that one way in which angel investors adapt to the changing investment environment across nations is by attracting and selecting different types of transactions. It would be interesting to examine whether angel groups also adjust in different ways, whether by varying the contracts they write with the entrepreneurs they fund (as we document that venture capital and private equity funds do in our earlier work) or by adjusting the intensity of oversight provided. In addition, we would like to understand better how these differences in the funding environment affects the selection of people who choose to be entrepreneurs. Another fertile area for research would be to examine how angel groups reacted to the rapid emergence and professionalization of venture capital funds, as has happened recently, for instance, in China and India. We believe that our results on angel groups might also speak to some of the more recent innovation in crowdfunding platforms and the idea of providing a broader access to start-up investments to a broader public, where individual retail investors could participate in angel funding. This democratization of access has been a success in other industries: for instance, ridesharing platforms, apartment rental, etc. But our results strike a somewhat cautionary note for the application to seed-stage investing. First, even our results from some of the premier angel groups in the country show that there is a lot of risk and skewness in the returns to these groups. So investors have to be able to sustain such an investment profile. Second, and more importantly in our context, the major impact of angel groups lies in the value added and hands-on improvement that they provide to their start-ups rather than just access to funds. It will not be easy to replicate these impacts on a decentralized funding platform. In crowdfunding, investors are miniscule and are not in a position to provide the same value added to the investments. In fact, several crowdfunding platforms (for example, AngelList) have realized this and are experimenting with innovative funding structures where a few select investors act as syndicate partners, directing the investments of other (smaller) investors on the platform. The idea is precisely to facilitate the provision of value added service even in the decentralized online environment. There are several innovative new approaches being tested at the moment, but the jury is still out how investors will fare from these investments. Josh Lerner is the Jacob H. Schiff Professor of Investment Banking at Harvard Business School, and head of the Entrepreneurial Management unit. He graduated from Yale College with a special divisional major that combined physics with the history of technology. He worked for several years on issues concerning technological innovation and public policy at the Brookings Institution, for a public-private task force in Chicago, and on Capitol Hill. He then earned a Ph.D. from Harvard’s Economics Department. Much of his research focuses on venture capital and private equity organizations. (This research is collected in three books, The Venture Capital Cycle, The Money of Invention, andBoulevard of Broken Dreams.) He also examines policies on innovation and how they impact firm strategies. (That research is discussed in the books Innovation and Its Discontents, The Comingled Code, and the Architecture of Innovation.) He co-directs the National Bureau of Economic Research’s Productivity, Innovation, and Entrepreneurship Program and serves as co-editor of their publication, Innovation Policy and the Economy. He founded and runs the Private Capital Research Institute, a nonprofit devoted to encouraging access to data and research about venture capital and private equity, and serves as vice-chair of the World Economic Forum’s Global Agenda Council on the Future of Investing. Among other recognitions, he is the winner of the Swedish government’s Global Entrepreneurship Research Award. He has recently been named one of the 100 most influential people in private equity over the past decade by Private Equity International magazine and one of the ten most influential academics in the institutional investing world by Asset International’s Chief Investment Officer magazine. He currently serves as Vice Chair of the World Economic Forum’s Global Agenda Council on the Future of Investing. Antoinette Schoar is the Michael M. Koerner (’49) Professor of Entrepreneurial Finance at the MIT Sloan School of Management and the Chair of the MIT Sloan finance department. She holds a PhD is in Economics from the University of Chicago and an undergraduate degree from the University of Cologne, Germany. She is an associate editor of the Journal of Finance and the co-chair of the NBER Entrepreneurship group. Her research interests span from entrepreneurship and financing of small businesses in emerging markets to household finance and intermediation in retail financial markets. She received several awards including the Brattle Prize for best paper in the Journal of finance and the Kauffman Prize Medal for Distinguished Research in Entrepreneurship in 2009. She has published numerous papers in the Journal of Finance, Journal of Financial Economics, the Quarterly Journal of Economics and others. Her work has been featured in the Economist, the Financial Times, the New York Times and the Wall Street Journal. She also is the cofounder of ideas42 a non-profit organization that uses insights from behavioral economics and psychology to solve social problems.